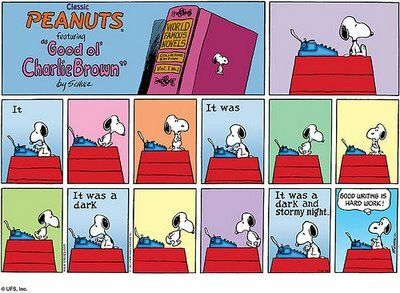 Snoopy has it right. Good writing is HARD! Me: You can’t do that! Protag: But I’m happy. Don’t you smile when you’re happy. Me: But you smile way too much. Protag: Seriously? It’s a BAD thing that I’m a happy character. Do you want me to turn all emo on you? Because you really won’t like it when I have to write all that bad poetry to reveal my soul. Me: It’s not that, really. You just can’t smile so often. Could you, perhap, do something else when you’re happy? Protag: What if I SING AT THE TOP OF MY LUNGS A HAPPY SONG? Me: Um… no. That’s not what I had in mind. Protag: (tapping her foot, arms folded) So… what should I do? Is there a trait that your characters do too often? I’ve heard Bree Despain say that (before her revision) she had her protagonist throw up way too frequently. So it seems to be a common thing. In my random wanderings around the internet, I ran across this helpful blog, The Bookshelf Muse. Angela Ackerman helps give us a solution by providing an EMOTIONAL THESAURUS. Check it out! So what things do your characters do too frequently? Such a good post! My character’s tend to have little “tics” like that too. In one of my short stories I had people cocking their heads right and left. Never picked up on it until the revision. It nearly gave ME a tic! My characters sigh and roll their eyes a lot. Carol pointed that one out. I think it’s because I sigh and roll my eyes a lot. I’m kind of sarcastic, I guess…and my characters end up being more like me than they should. Ha, Cheryl, my characters sigh a lot too. And in one chapter I wrote recently, I noticed that my character leans her head back or presses her forehead to things a lot. She’s finding out she’s in a magical world, which is so crazy, so she is pressing her forehead into her arms, against a rock, leaning her head back against a tree. And sighing. All the while, sighing. It made me laugh when I realized it. Hee hee — I agree, maybe it’s the characteristics we do ourselves that our characters do. (Yes, that’s a poorly constructed sentence, but I’m on a time crunch here!) For me, it’s gasping — which I do like a fish out of water. It’s so sad when I realize I forgot to do something and one of the neighbor kids is over… they think they’re in BIG TROUBLE. Of course, my kids just think it’s normal, so maybe that means they’re in trouble too much??? You guys have all brought up such good points! It’s so funny how our characters mirror our own habits. My characters have an annoying habit of walking into scenes they aren’t supposed to be in. One particularly persistent character loves to walk in from other stories just to pester the people in the scene, especially if they’re the kind of person that would annoy him. This most frequently shows up in my dialogue. If someone says something that’s totally out of character, it’s not my fault, it’s his.